Wouldn’t it be great to collect all your favorite sayings, quotations, or inspiring verses in one place – and to make them a visible part of your everyday life? 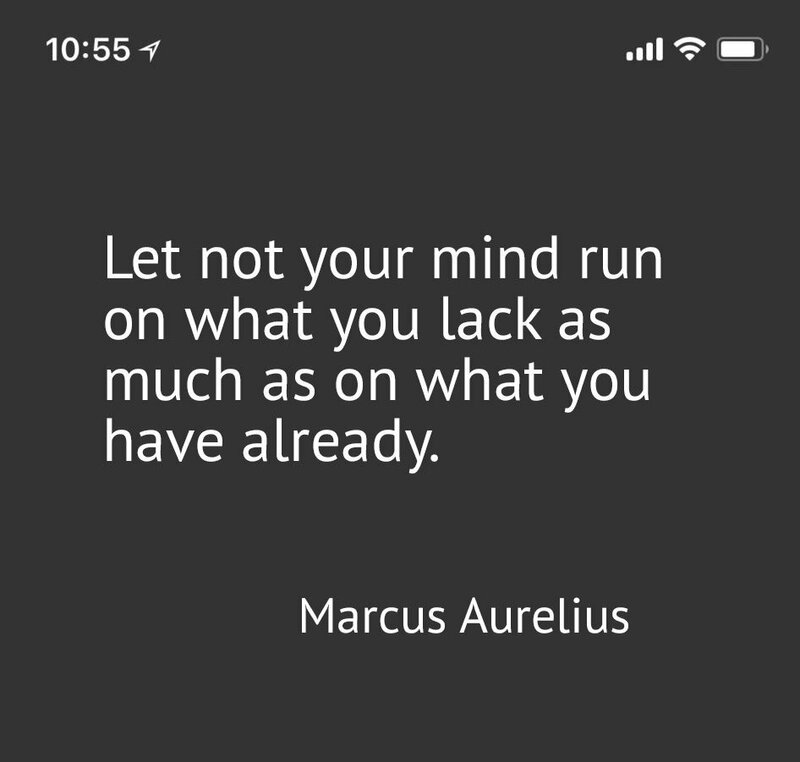 What Do You Want to Keep In Mind? Are there things that you’d like to keep in mind through the ups and downs of daily living? Perhaps an inspirational quote that you’ve seen or verse or teaching that you resonate with? 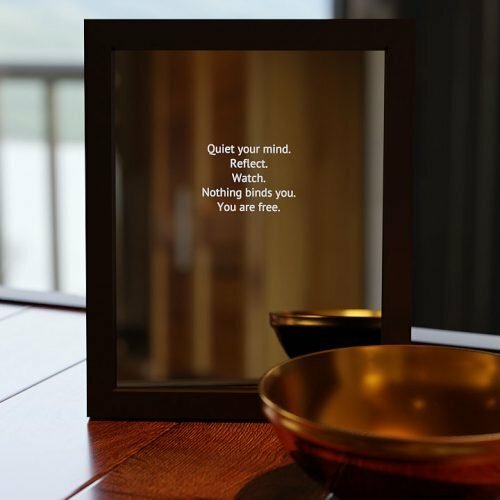 The Contemplative Mirror allows you to collect these quotations and display them as a visible part of your daily life. Things tend to settle in more deeply with repetition. Seeing a favorite quote again and again can help cement that awareness into everyday consciousness. Add an unlimited number of quotations to your mirror. The Contemplative Mirror™ uses a display screen mounted behind a two way mirror. The white text shines through the two way glass and the black background does not. 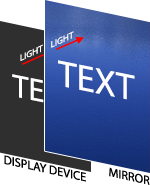 The effect is that you only see the white text elegantly resting on the mirror’s surface. It’s a beautiful way to display, and be reminded of, meaningful content that would otherwise sit in a notebook somewhere. With each new entry, your content will fall in with the random display of all the entries you make, resting for an hour or a day – for your contemplation and enjoyment. You can also view your collection while on the go using your smartphone or tablet. Add as many saying, quotations, verses, poems, etc., as you like! Your mirror can hold an unlimited amount of content. Your Contemplative Mirror™ comes with its own SimplyReflecting™ website which is where your collected quotations, verses, etc. safely reside. Connect the mirror to your Wifi network, then place it on a table or wall. From there you can log in to your personal website from any computer or smartphone anywhere at anytime. Your content is stored with redundant backups so it won’t be lost. The Contemplative Mirror™ is great for people who love literature, scripture, teachings, or sayings of any kind! With the Contemplative Mirror™, you add the content you want to see displayed in your mirror. The mirror then randomly loads the content you’ve entered each day or hour. The Contemplative Mirror makes a great gift for yourself or a loved one. The recipient can collect sayings and inspirational quotes, scripture, or anything that is meaningful to them and have them elegantly displayed through the years. The Contemplative Mirror™ is also great for people who want to stay inspired about their long term goals. Enter your goals along with other content and be reminded when your goals are randomly displayed throughout the days, weeks, and months. That led me to a vision of being able to display text on glass in a vertical way that could sit on a table. It turns out that the technology needed to do this is only barely coming into existence and is still extremely expensive. Not a practical solution. While researching this however, I did stumble across the popular phenomenon of “smart mirrors.” The term “smart mirror” refers to a two way mirror with a display device behind it that is connected to the internet and can display information like the date, weather, your personal calendar and things like that. Those kind of things don’t interest me but I saw that this could perhaps be a way to make my vision a reality. During the process of building the first mirror, I realized I wanted to have the quotes display randomly. This way, I simply enter all my quotes, sayings, teachings, etc. which are then displayed in a unpredictable way as the days go by. This method creates an enjoyable, uplifting, and at times even supportive experience as I’m reminded each day of the principles and teachings that I choose to live by. Having them load randomly keeps it interesting. I started out using an acrylic mirror because they are cheaper; however, I decided to use real glass mirrors because they create a better quality product and the text display is actually much brighter and clearer. I am surprised at how beautiful and elegant the solution has turned out to be. And it does work. When I come down in the morning for breakfast, there is a message for the day waiting on the mirror. I’ve found I prefer to just load one saying per day so I can continue to contemplate it throughout the day and evening. Others may prefer to have content load more often, say every hour or even 15 minutes. During the conceptual part of the design process, I also realized that I wanted the mirror to be able to turn off at night and when I’m not at home. This detail seemed important in designing something that would last as long as possible. If the mirror contained a display device that was on 24/7, surely it would burn out within a couple years (or less). As it turns out, the final design does have a adjustable schedule to turn the mirror on in the morning and off at night. In addition, the mirror can be set to use motion activation which further extends the life of the display screen. For my own mirror, I have it set to motion activate and then turn off after 15 minutes if I’m not in the room. Another part of the design process was figuring out how to get content into the mirror. Since it is encased inside a frame, it would be too inconvenient to have to open it up to add content. That means that remote access would be needed. So I simply built a website that would allow me to easily enter the content from my laptop or smart phone – whenever the inspiration strikes. 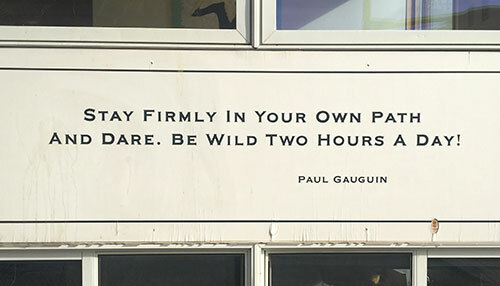 For example, if I’m out and about and happen to see a quote that inspires me, I can just open up my smart phone and type it into my mirror right then and there. Or if I’m in bed reading in the evening and come across something I want to remember, again I’ll just grab the phone and speak it right into the mirror. For longer material, I can just go and copy and paste the source material. Since the website is password protected from the public, there are no copyright issues to worry about. The material is private and for my own personal use. An added bonus is that because the content is stored in a website, I’m able to bookmark the site on my phone and can view the randomly loaded quotations, teaching, etc.. while I’m waiting in line at the grocery store or at a stoplight. That makes for a nice alternative to checking email or social media. I am truly delighted to finally have somewhere to store all my favorite sayings, long term goals, teaching, scriptures, etc. and to have them be visible in my daily life. In addition, the effect is elegant and beautiful. The mirror actually looks better in real life than in any of the photos on this site. It can stand on end, on its side, lean back on a stand, or be hung on the wall. There is a power cord though, so I think it looks best on a table top where that can be hidden. I also realized during the process of designing the mirror that it would be great for families as they can discuss together what they want to put in the mirror – what values are important to us? What are the concepts we want to live by and be reminded of? I hope you will enjoy your Contemplative Mirror for years to come! In addition to displaying your mirror, you can access your personal collection of quotes from anywhere, anytime using your smartphone. Get your day back on track by referencing your inspirational quotes! Your mirror comes with its own SimplyReflecting website. This is where you will collect all your quotes, sayings, or whatever content you choose. You can access your password protected website from anywhere using a desktop computer, laptop, tablet, or smartphone. And your mirror will work anywhere there is a WiFi network. See the product page for SimplyReflecting website subscription options. If anything happens to your mirror, your content will not be affected. If you ever need an export of your saved content, one can be provided upon request for $24.99. There is a 30 day, no questions asked return policy. Return shipping is not covered. If anything about your Contemplative Mirror is not in working order on arrival, we will do everything we can to make it right!